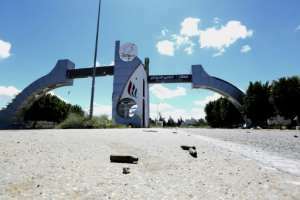 Fighting raged around Tripoli and an air strike closed its only functioning airport Monday, as Libyan strongman Khalifa Haftar defied international calls to halt his advance on the capital. Thousands were also reported by the United Nations to be fleeing the capital city in the face of Haftar's surprise assault which has left dozens dead. The EU's foreign policy chief added her voice to those urging the eastern strongman to stop his offensive, after calls for restraint by the UN Security Council and the United States. "I make a very strong appeal to Libyan leaders and in particular to Haftar to stop all military activities... and to return to the negotiation table", Federica Mogherini said after talks with EU foreign ministers. Haftar's self-styled Libyan National Army claimed Monday's air strike against Mitiga airport, east of the capital. LNA spokesman Ahmad al-Mesmari said the strike targeted a MiG 23 military plane that was preparing to take off towards Misrata, some 200 kilometres (120 miles) east of Tripoli. A security source at the airport said the strike hit a runway without causing casualties. The UN's envoy to Libya, Ghassan Salame, denounced the strike. "This attack constitutes a serious violation of international humanitarian law which prohibits attacks against civilian infrastructure," Salame said. A spokesman for national carrier Libyan Airlines said the civil aviation authority decided "to suspend aerial traffic until further notice". An airport source, who did want to be named, confirmed the suspension. The oil-rich northern African country has been rocked by violent power struggles between an array of armed groups since the NATO-backed overthrow of dictator Moamer Kadhafi in 2011. 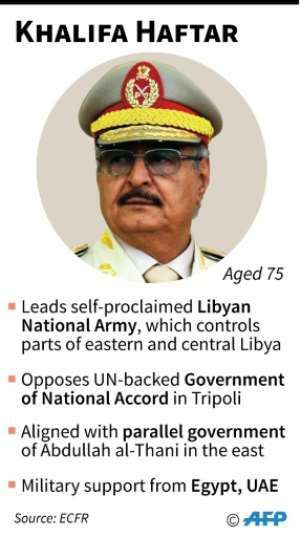 Haftar, a former Kadhafi military chief, has emerged as a major player. His LNA backs an administration in the country's east in opposition to the UN-backed Government of National Accord. 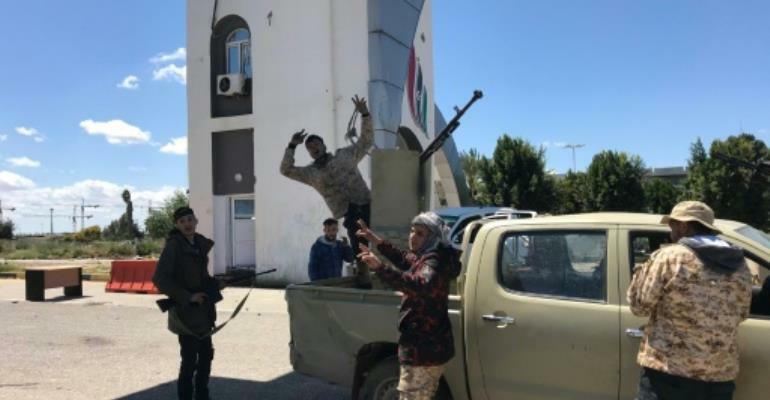 Having seized control of much of eastern Libya -- and buoyed by a series of victories in the desert south -- Haftar turned his sights on Tripoli, vowing to "cleanse" it of "terrorists and mercenaries". After a pause overnight, fighting resumed Monday morning around the capital's destroyed main airport, some 30 kilometres (18 miles) south of Tripoli, and the rural area of Wadi Rabi further east. World powers have expressed alarm at the violence, saying it threatens to further destabilise Libya and derail UN-led efforts to find a political solution to the country's woes. The US has appealed for an "immediate halt" to combat operations and the UN Security Council has called on Haftar's forces to stop their advance. On Sunday Russia blocked proposals for the council to adopt a formal statement, instead insisting that all Libyan forces be urged to stop fighting, diplomats said. But the Kremlin on Monday urged "all sides to reject actions that could provoke bloodshed in battle and the deaths of civilians". 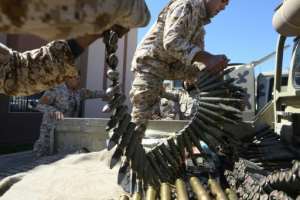 Fierce clashes Sunday near Tripoli saw Haftar's fighters and other powerful western Libyan armed groups exchanging fire including air strikes. Forces backing the Tripoli-based GNA on Sunday announced a counteroffensive dubbed "Volcano of Anger". Unity government health minister A'hmid Omar told Libya's Al-Ahrar television station late Sunday that around 50 people had been wounded along with those killed. His ministry on Monday put the death toll at 35. Haftar's forces have said 14 of their fighters have died. She again urged the warring parties to implement a temporary humanitarian ceasefire. The previous day, fighting raged throughout a two-hour window set by the UN for a pause in hostilities for civilians and the wounded to flee. Haftar's offensive has threatened to plunge the country into a full-blown civil war and once again thwart diplomatic efforts to find a solution to Libya's woes. It was launched just days ahead of a planned UN conference aimed at uniting Libya's rivals and paving the way for elections. The UN's Salame has insisted the international community is "determined" to go ahead with the April 14-16 conference. The UN mission in Libya said on Twitter that Salame met Monday with unity government head Fayez al-Sarraj in Tripoli to discuss how to "assist at this critical and difficult juncture".